Dimpled skin, commonly called cellulite, develops when fat presses against your skin's connective tissues. Cellulite doesn't always indicate a poor diet or unhealthy lifestyle. For some people, the dimples are hereditary. Although cellulite won't hurt you, it can make you feel self-conscious about the way you look. No cure exists for cellulite, but that doesn't mean you can't improve your skin's appearance. Anti-cellulite creams, exercise and a healthy diet all play a part in making dimpled skin look smooth and supple. 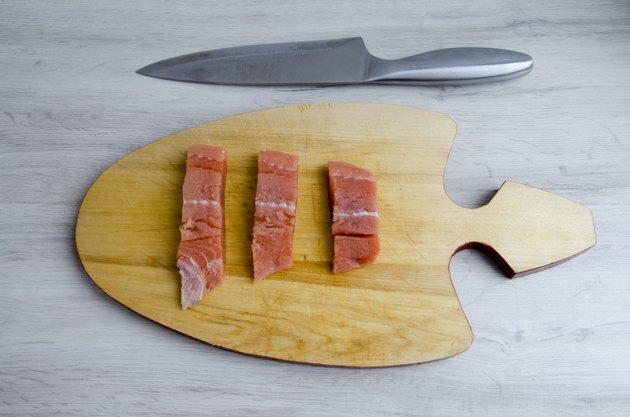 Eat foods rich in omega-3 fatty acids, such as salmon. Salmon's antioxidants break down the fat cells in cellulite. The omega-3 fatty acids repair skin tissue and reduce inflammation. Other omega-3-rich foods include salad greens, spinach, kale, walnuts and Brussels sprouts. Snack on foods that contain vitamin B6, such as sunflower seeds and hot peppers. Vitamin B6 repairs connective tissue and eases the bloating that can make fat dimples more visible. The capsaicin in hot peppers may also boost your metabolism for as long as three hours after eating them. Drink several large glasses of water each day. Water strengthens collagen and helps to reduce the appearance of dimpled skin. It also helps your body get rid of excess fat. Smooth over cellulite with a natural-bristle brush before bathing to exfoliate skin and allows it to absorb smoothing creams more easily. Apply an anti-cellulite cream, which can temporarily tighten skin, twice a day. Smooth on the cream in the morning after showering. Most creams start to wear off after six to eight hours, so apply the second layer at midday. Massage dimpled skin daily with a ground-coffee exfoliant or cream. Caffeine tightens skin and can temporarily make cellulite less noticeable. Exercise to tone your muscles and hide dimpled skin. Perform squatting exercises to work the muscles in your hamstrings and thighs, where cellulite often appears. Hold a heavy object with both hands against your chest. Squat down as far as you can, then stand back up. Repeat this as many as 20 times. Perform stretching exercises to boost circulation and reduce the appearance of cellulite. Lie on your back and fully extend your legs. Bend one leg and pull your knee up to your chest. Hold the position for 20 seconds, then repeat with the other leg. Repeat this exercise three times a week. Self-tanner spray or cream lets you hide cellulite in a pinch. Apply the product to your whole body so the tan looks natural.